The first jump made by saboteurs was made by the Italians in 1918, and in 1927 they were the first to drop troops. In 1929 the first engagement of airborne troops (fifteen Russians from three airplanes) against a bandit army in Central Asia took place. 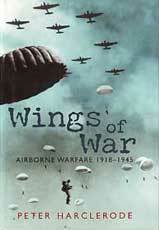 Eleven years on airborne forces had completely and radically changed the way war on the ground was conducted. This book covers all aspects of air-borne forces, including the aircraft, specialist equipment and systems developed for the safe delivery of airborne troops, vehicles, weapons and other equipment, right up to the present day.